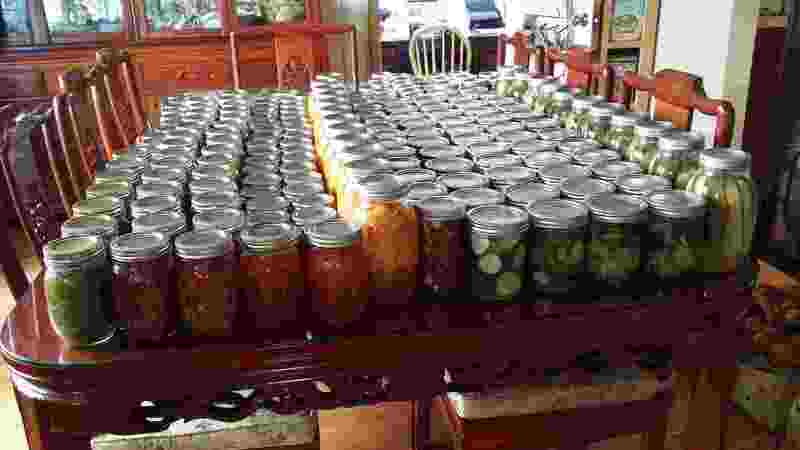 Welcome to my adventures in canning, cooking, gardening, a navy wife trying to farm out of a container while moving every 12-18 months. So I have a very bad habit. I’ll always intend to label my jars. How could I ever forget after hours of intense labor of love over batches of golden fruit and ruby red tomatoes? How could you ever possibly forget what went in that jar? Well here is some insight into the way a disorganized canner thinks. Hmm let’s see what’s in the jar, what’s the consistency? Hmm is that a strawberry? Oh yeah! Eureka! I made peach strawberry jam last year. Okay now look for all the peach colored bottles with strawberry looking things in them. Brown stuff.. hmm peach butter, apple butter, some sort of butter. Label it Fall fruit butter, yeah, that’s the ticket. That approach also works when you can’t figure out if it’s raspberry, blueberry or black berry jam you just call it summer solstice preserves or berry bounty. Crap I just gave away my last jar of… Really when your reaching on that top cabinet to make a giveaway basket and you grab in a box you can’t see you assume that there is a limitless supply of last years New England Apple Butter. Those black bits, really trust me their spices in jams, or better yet “Roasted Tomatoes” in your salsa, What they really are are bits because you let the pan burn on, because you got caught up in somebody’s post about “the pro’s and con’s of a kitchen aid” in your facebook white walls kitchen group. Hmm not good enough to give away/or not sure what It is but we can open it and hubby will eat it. Definitely not good enough to give away might not be good enough to eat. Hmm will put it in a cake or stew. If I call it “topping” or “syrup” It was supposed to be a jelly or jam that didn’t setup properly. Those friends who know you well enough that you can label the jar mystery berry jam. That jar of Blueberries you just found from 2008… Really they might be good. No really throw them away. Exception to the rule above Honey. In our family there are jars and jars of sugared honey squirreled away from various good beehive batches over the years. I am in possession of the last known two jars of honey that came from my dad’s farm. That stuff doesn’t go bad. Just heat the jar in a pot of water and voila. Honey again. If it’s gotten dark we call that stuff “cooking honey”. Honey is like wine it has it’s own flavor based on region. A taste of honey reminds you of a place. How to embrace the unwanted child of your garden Zucchini!